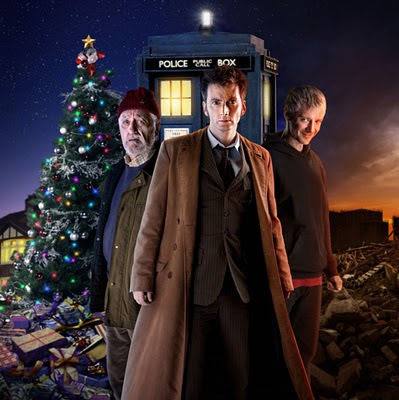 I couldn't let the week pass without a review or at least a passing comment with regard to David Tennant's swan song as the 10th Doctor (but who's betting he'll be back for a multi doctor adventure in the future... even if it's just for Children in Need). Before I go any further I have to claim bragging rights on Wilf's involvement (albeit inadvertent) in the 10th Doctor's demise... I totally called it back in November! In terms of plot mechanics, a lot of RTD's usual problems were there (too many plot threads coming from nowhere and leading to nothing); I happen to think this is a bad habit that has come from his pathological need to pull the wool over the eyes of the fans - he leaves too many red herrings that get in the way of the story. That aside, I found the plot very moving (particularly the last half). I was very excited at the prospect of seeing the Time lords again and equally sad to see them return to their doom. I was hoping for a sort of reset, where the Doctor becomes a renegade on the run from his race again... it certainly looked like it was going that way. I have heard speculation that the questions left by reintroducing Rassilon (albeit temporarily), the identity of the unknown Time Lady... and what happened to The Master, may actually be a set up for future Moffat stories. and.... well I shall come to that in a bit. I know that Andrew and Alastair both have reservations with regard to what they perceived as an over sentimental last 20 minutes. However, I for one am a bit of a sentimentalist myself... and due to my empathic nature, I was hooked. During The Doctor's farewells (claiming his reward... I more than think just a little that this was RTD using artistic licence to claim his own reward by saying his own fond farewells to characters he had enjoyed writing for), I was particularly touched by the farewell to Mickey and Martha and Sarah-Jane. You could see the mark of doom and what was coming written all over The Doctor's face... kudos to Tennant there. Of course, only we as the audience... and Sarah-Jane truly perceive what the Doctor's expression is saying. Then we had the big moment... the regeneration scene. Some say it was overdone - the TARDIS exploding and catching fire might seem wrong from a purely in universe perspective... however I think it works. I believe it's bending the fourth wall without breaking it. It's an "in universe" acknowledgement of Tennant's massive contribution and importance to the revival of Doctor Who as a franchise. Yes it became popular again with Ecclestone... but Tennant magnified and consolidated that popularity and became so well established as the Doctor in the public consciousness, that he displaced even Tom Baker as the nation's favourite Doctor. Cue the dramatic music and the special effects and the TARDIS grieved with us as flames and explosions rocked through the console room. I have to say that when I first saw Matt Smith appear, I wasn't too thrilled... but seeing that scene again and again does kind of warm you to his interpretation a little. When I look at him I do see a few of the other Doctor's in him... which stands him in good stead. I saw this entire scene as The Doctor's equivalent of Gethsemane. Like Jesus, he had an opportunity to escape his fate and do so much more. The Doctor was under no obligation to save Wilf... he had strayed into that booth of his own accord and yes... he was an old man. past his years. The Doctor could have achieved countless more wonders and amazing tales in his current incarnation. There was no rational reason why the Doctor should have elected to make the supreme sacrifice. And yet there was the perfect reason... LOVE. 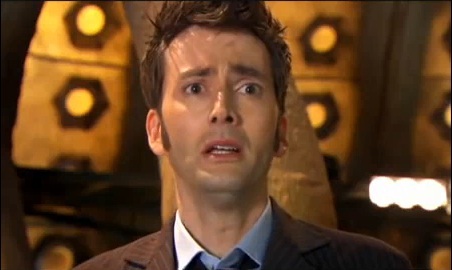 The Doctor lay down his life for Wilf because he loved the person of wilf. He saw beyond the mere circumstances... what mattered most to him was that here was a man whose well-being meant something to The Doctor. So The Doctor literally substituted himself for Wilfred Mott. In the same way, Jesus Christ literally substituted himself for us. Jesus did not have to die. He could have called legions of angels down and ruled us as a god amongst men... leaving the countless generations of the human race to be born after him , to wilt and die in our brokenness. Being in very nature God, he could have done whatever he wanted. We didn't deserve the sacrifice he made... and if we saw him we might tell him so, just as Wilfred pleaded with the Doctor. But Jesus loves each one of us so much that he saw it as an honour to lay down his life for us. Too often we think of sin in the vilest terms and perhaps when we think of it's universal consequence, that's appropriate. However Wilfred Mott was not vile... he was a good man. He just ended up in a very bad situation... the wrong place, in the wrong time. Like a sheep he merely went astray. ... but we are broken and we have all strayed in to a very bad place by virtue of our broken nature. "You see, at just the right time, when we were still powerless, Christ died for the ungodly. Very rarely will anyone die for a righteous man, though for a good man someone might possibly dare to die. But God demonstrates his own love for us in this: While we were still sinners, Christ died for us." Nick, nice review and spiritual comparison. I can be sentimental too but that was, as you know, too much for me! Loved Tennant but really looking forward to Matt Smith's Doctor to see where the show goes. My theory for David Tennant leaving the Dr. Who series is to work on a new series here in Chicago called "Rex Is Not Your Lawyer". The ending of this episode was great however it copied Spock's death scene from Star Trek The Wrath Of Khan. That would be Spock's death scene behind radiation proof glass on the Enterprise. Spock was reborn just like our dear Dr. Who.